We are in the final days of the Barkerville season. The air is getting colder, the hillsides have turned golden, and the pace of life on the street has slowed. In summer much of my time is caught up in the energy and intensity of crowds and performances. In September, however, our schedule is far less demanding and my days are freer to luxuriate in a slower version of Barkerville. In September I notice the changing light and shadows as summer fades into autumn. I look under the boardwalks at wet little ecosystems curling into dormancy. I take the quieter moments, when many visitors are off the streets and in the Theatre Royal or over at the Waterwheel Show, to visit some of my friends who work in our onsite businesses – friends who are so busy in the main season we hardly have a chance to connect. This September I have been able to pop into McMahon’s Confectionary to chat with Ronnie and Windsong. We catch up, reflect back on the season we’ve shared, ask after each other’s families, and check in with what’s next for us as we put our Barkerville dresses away until Christmastime. I have known Glen, our BX Express teamster, for years. I’ve watched his children grow up and have children of their own. In September Glen and I have a chance to lean on the boardwalk railings and talk about everything and nothing as his big horses snort occasionally beside us. At the Goldfield Bakery I spend my final Barkerville work days sampling the divine treats I’ve done a reasonably good job of avoiding all summer (trust me, when you work in such close proximity to a bakery this good, you have to pace yourself). In September I let myself have a massive sticky bun, a brownie and the most sinful of all, a fat john. I’ve barely had a chance to talk with the bakery ladies all season, as their well-deserved line ups preclude it in the busy months. Neil and Evangeline, who operate the Wake-up-Jake restaurant, are lovely people and their two sons have grown into fine young men who, in turn, have kept us laughing all summer, when they weren’t gracing us with impromptu classical guitar concerts. I am especially fond of Evangeline’s soups, and I try to fit in a few bowls before the season ends. The House Hotel is a favourite gathering place for the Barkerville interpreters. The food and drink flow, and Rose, Sam, Ted and their family and staff are as funny as they are friendly. This season they hired a young woman called Emma as a server, and she happens to be a gifted musician. The sound of Emma’s piano playing or cello solos drifting out onto the streets after work has added so much to the ambience of our gold rush town. I savour her final concerts as I laugh and chat with my hosts. Pat, at L.A. Blanc Photographic Studio is another old friend. Her gallery is so busy during the summer months that it’s only in September that we really have a chance to catch up, and she can fill me in on the details of her children’s lives. Her kids were children and teenagers when we first met, now they are off in the world having exciting adventures. Amy and Richard at the Theatre Royal are dear friends I have known and worked with for years. We have walked together through so many shows and seasons. I stop outside the theatre for a chin wag with them almost every day. McPherson’s Watchmakers and Jewelry store owns a large piece of my heart and a fair chunk of my income. The Mason and Daly is a great place to drop in during this late part of the season to pick up a few final Victorian items while I still can. Mrs. Douglas will always greet you at C. Strouss Dry Goods with a smile as she stands before the looming wall of teas, and she always remembers how you like your coffee (and if you have never heard this woman laugh, you don’t know what you’re missing). The day the Lung Duck Tong closes for the season (which it already has, on the 21st this year) is basically a day of mourning in Barkerville. We spend our winters longing for their Szechuan beef and Cantonese special chicken, and achingly have to wait until they reopen in May. I usually don’t have much time during the season to visit the El Dorado Goldpanning & Gifts, or the Quang Sang Wing Chinese Store, or the Chinese Embroidery Gallery, because these businesses are at the farthest ends of town, so in the fall I make sure to get in there to look at all their wares. If I catch them during a break in the action, I can usually find a moment to talk with our always busy Bed & Breakfast operators, Saya and Carol (whose daughter Tish was also onsite this season) to wish them a safe and happy winter. Barkerville’s businesses are such a vital part of our seasonal lives, and the people who work in them are treasured members of our community. I look forward to seeing them again next May, when we all come together again for another spectacular season. 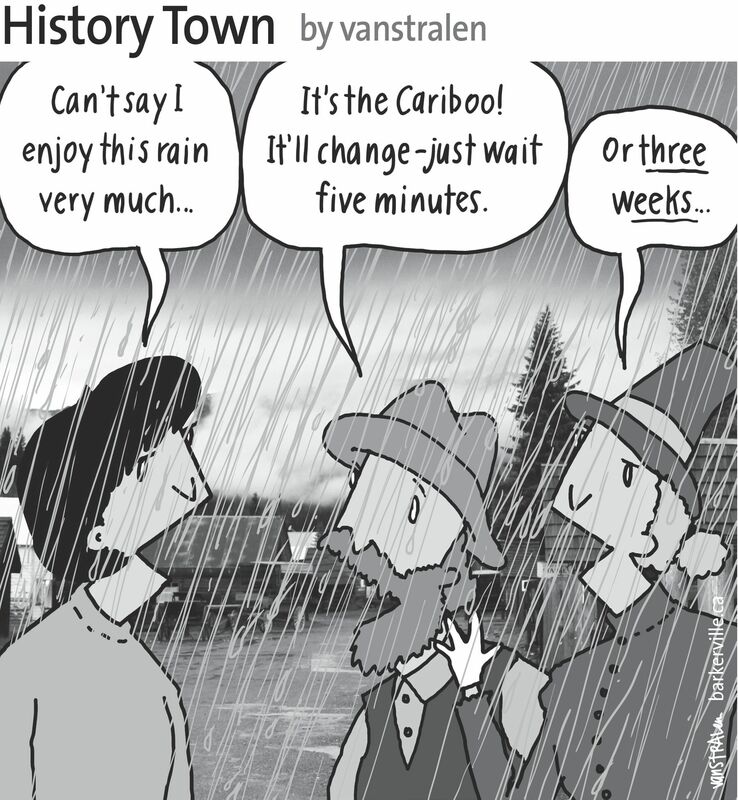 The above one-panel cartoon (originally published September 26, 2015) by Dirk Van Stralen, with accompanying editorial by Danette Boucher, is the sixteenth of twenty weekly entries that were logged – and subsequently blogged – as part of a 2015 collaboration between Barkerville, British Columbia and the Prince George Citizen aimed at introducing the quirkier side of living, working, and playing in the Cariboo Goldfields. We hope you enjoy! Great post – it is like you have been our Front Man/Woman for the season and we just got to meet the band ! In this case all the people and places that make Barkerville the great place it is – complete with the sights, sounds, yummy flavors and a sense that you are not just co-workers but a Barkerville Family!